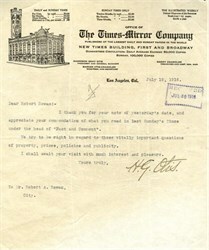 Original letter from the Times-Mirror Company, publisher of the Los Angeles Times signed by Harrison Gray Otis as President and General Manager dated 1916. The letter is on Times-Mirror Company letterhead and shows Harrison Gray Otis as president and general manager of the Times-Mirror Company. 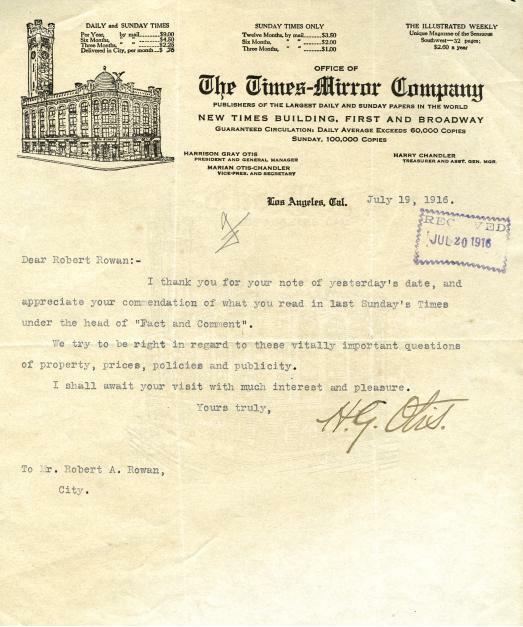 The letter was sent to Robert A. Rowen who was a Los Angeles Real Estate Developer. Harrison Gray Otis (1837�1917) was the president and general manager of the Times-Mirror Company, publisher of the Los Angeles Times. Otis was born near Marietta, Ohio, on February 10, 1837, the son of Stephen and Sara Otis. His father was from Vermont and his mother, a native of Nova Scotia, Canada, came to Ohio from Boston, Massachusetts, with her family. The young Otis received schooling until he was fourteen, when he became a printer's apprentice. Otis and Eliza Ann Wetherby were married in Lowell, Ohio, on September 11, 1859, and they had three daughters, Lillian Otis McPherson, Marian Otis Chandler, who was secretary of Times-Mirror, and Mabel Otis Booth. He was a Kentucky delegate to the Republican National Convention that nominated Abraham Lincoln for president in 1860. At the outbreak of the Civil War in 1861, he left his job as a compositor in the office of the Louisville Journal to volunteer as a private for the Union army. Otis fought in the 23rd Ohio Infantry. He was promoted through the ranks and was made on officer, a lieutenant, in November 1862 and left the Army in July 1865 as a captain. He was wounded twice in battle, was "twice breveted for gallant and meritorious conduct" and was promoted seven times. After the war, Otis was Official Reporter of the Ohio House of Representatives, then moved to Washington, D.C., where he was a government official, correspondent and editor. In 1876, he and his family moved to Santa Barbara, California, which had a population then of about 3,000, and he purchased a local newspaper, the Santa Barbara Press, from C.W. Hollister, effective March 11 of that year. He gave up journalism temporarily in 1879 when he was offered the post of chief government agent or special treasury agent of the Northern Seal Islands, now known as the Pribilof Islands, in the Pacific Ocean off the coast of the newly acquired territory of Alaska. He left that position in 1881 to return to Santa Barbara. Otis was editing his newspaper there when he went to Los Angeles � a larger city with a population of some 12,500 � and agreed with the firm of Yarnell, Caystile & Mathes to take over editorial responsibilities at the Los Angeles Daily Times, now the Los Angeles Times. Beginning August 1, 1882, he was to "have the editorial conduct of the Daily Times and Weekly Mirror," according to an announcement in the Times. Later the company was named Times-Mirror, and on April 6, 1886, it was reorganized, with Albert McFarland and W.A. Spalding as owners and Otis as president and general manager. That was Otis's official title at the time of his death in 1917. The Times story about his demise noted that the Times-Mirror Company was "publishers [sic] of the Los Angeles Daily Times." The article called Otis the "principal owner" of the newspaper but never referred to him as publisher. Eleven years earlier, however the Associated Press had called him "publisher of the Los Angeles Times." When the Spanish-American War broke out in 1898, Otis asked President William McKinley for an appointment as Assistant Secretary of War. But Secretary of War Russell A. Alger did not want the conservative Otis serving under him. Otis thereupon again volunteered for the Army and was appointed brigadier general of volunteers. He served in the Philippines. He did not see any action against the Spanish, but commanded the 1st Brigade, 2nd Division, VIII Corps during the Philippine-American War. Otis was known for his conservative political views, which were reflected in the paper. His home was one of three buildings that were targeted in the 1910 Los Angeles Times bombing. During his time as publisher of the Times Otis is known for coining the phrase "You are either with me, or against me." His support for his adopted city was instrumental in the growth of the city. He was a member of a group of investors who bought land in the San Fernando Valley based on inside knowledge that the Los Angeles Aqueduct would soon irrigate it. He died on July 30, 1917 at the home of his son-in-law, Harry Chandler.